EDINBURG — RGV FC’s Kai Greene sent a cross in from the right wing, and Nicolas Perea deflected it into the Las Vegas Lights keeper. The rebound came back to Perea, and he fired it into the keeper again. After the ball once more bounced back to Perea’s feet, he sent a cross toward the middle, where a Lights defender cleared it off the line. The Toros’ Wilmer Cabrera tracked down the loose ball and made a sliding attempt at a shot, which was also blocked by Las Vegas. This time, the clearance attempt came to RGV’s Conor Donovan, who unleashed a right-footed shot into the upper-left corner of the net from about 35 yards out. RGV repeatedly knocked on the door in the first half before Donovan’s strike finally kicked it down. The Toros as a team followed the same formula, ending a streak of missed opportunities and disappointing outcomes with a 2-0 victory against the Lights on Saturday at H-E-B Park. The win snaps RGV’s franchise-record 11-match winless streak, which dated back to April 25. RGV FC's Conor Donovan, left, celebrates a goal against Las Vegas Lights FC with Pablo Aguilar, right, and Kai Greene, behind, during the first half of their match Saturday, July 14, 2018 at H-E-B Park in Edinburg. RGV FC won the match 2-0. RGV FC's Jordan Jones has his jersey pulled by Las Vegas Lights FC's Rodrigo Iñigo during the first half of their match Saturday, July 14, 2018 at H-E-B Park in Edinburg. RGV FC won the match 2-0. 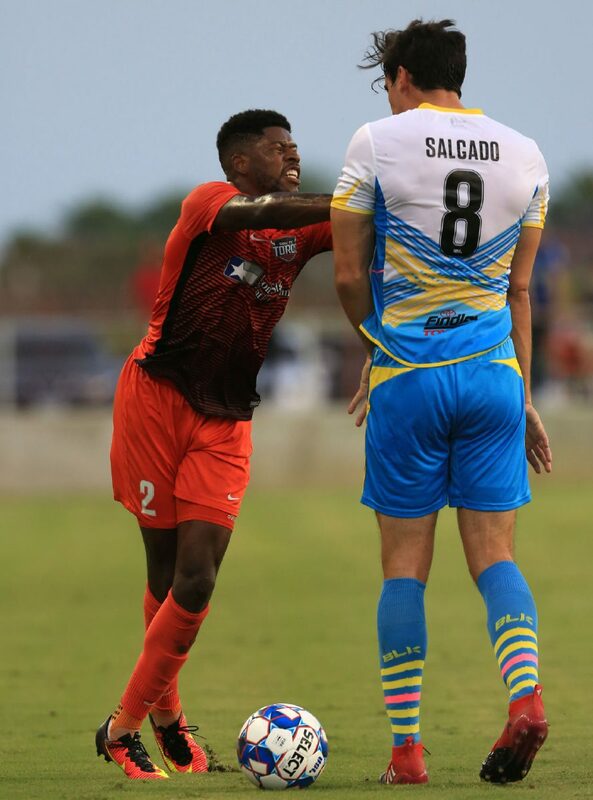 RGV FC's Kai Greene shoves Las Vegas Lights FC's Omar Salgado following a play during the first half of their match Saturday, July 14, 2018 at H-E-B Park in Edinburg. RGV FC won the match 2-0. With the victory, RGV improves to 2-6-10 on the year. The Toros outshot the Lights 17-11, including 6-3 in shots on target, and held 57.8 percent of possession. Those margins are hardly atypical for the Toros, who in recent weeks have expressed frustration at not being able to translate their statistical control of matches into wins. 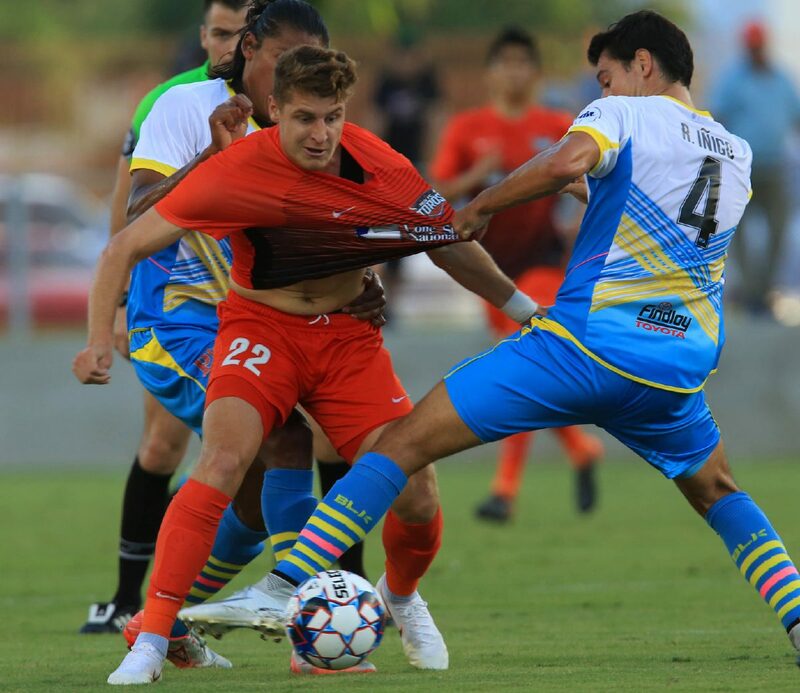 RGV FC coach Gerson Echeverry said Saturday’s game mostly followed a familiar formula, but he did point to a few changes compared to previous matches. For one, the Toros added an extra forward in certain stretches, Echeverry said. On Saturday, Jordan Jones made only his second start of the year at forward, while Wilmer Cabrera Jr. made his second start in the midfield. Aguilar was starting for the 10th time, but in a slightly different role. He said RGV focused more players in the midfield rather than on the wing, and he personally took on more attacking responsibility, leading the team with five shots. Aguilar also pointed to Wednesday’s 3-0 exhibition win against Liga MX squad Santos Laguna as a source of confidence for RGV FC. 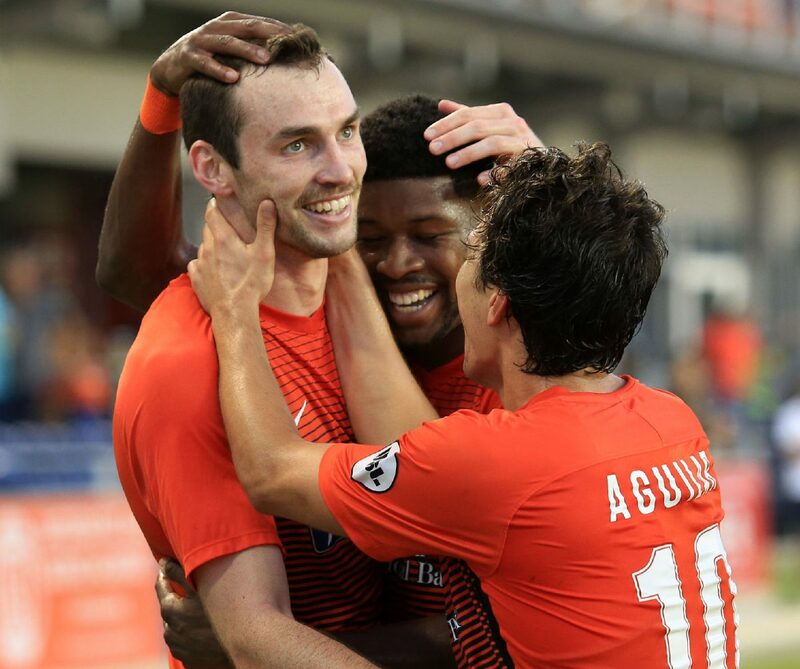 The Toros entered Saturday ranked last in the USL with 15 goals before Donovan found his breakthrough during the 45th minute. Enriquez scored in the 90th minute to ice the game. As Las Vegas desperately pressed forward, Aldo Quintanilla launched a counterattack. He dribbled from RGV’s half to about 30 yards from goal, then sent a pass to his left to Enriquez, who controlled the ball at the top of the box, took one touch forward and then sent a low shot through Las Vegas’ keeper. Enriquez said he dedicated the goal to an uncle who passed away a few years ago.